With a dedicated tool booth at METAV 2016, DATRON demonstrates the importance of high-quality CNC tools for optimal machining results. On the DATRON main booth DATRON high-speed tools are used with the high-precision machines DATRON M8Cube and DATRON MLCube LS (Linear Scales). At the international exhibition of technologies and metal working METAV, DATRON presents numerous system solutions and tools for efficient high-speed machining. For the milling machines M8Cube and MLCube LS and separately for high-quality CNC milling tools, DATRON invites visitors to stop at two exhibition areas in Düsseldorf. The DATRON main booth A52 in hall 16 is all about the live machining of "aluminum and more ..." demonstrated with the company’s leading products DATRON M8Cube and MLCube LS. With the aid of the special area for high-speed tools C82 in hall 16, the DATRON experts market their extensive portfolio of high-speed end mills for successful use with all standard CNC milling machines featuring hollow taper shank or direct shaft clamping - from 23 to 27 February. Only accurate tools facilitate significant added value for a production. 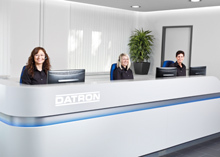 At the separate tool booth of DATRON, experienced experts consult visitors about economical milling with DATRON tools. A compatibility with machines from other manufacturers is a given. "We use our expertise in high-speed milling to prepare a proper tool mix for individual and demanding milling cycles for our customers", explains Dr. Arne Brüsch, CEO of DATRON AG. "As a manufacturer of high quality industrial machines, a decade of experience under our belt, the expansion of our own tool segment is the only logical conclusion." DATRON AG has effected this expansion very successfully with continuous innovations and patents over 20 years of business in the tools market. At METAV, the mechanical engineering specialist presents its new tool cooling, which meets highest demands regarding precision together with the 8kW- (HSK-E 32) power-spindle and the DATRON M10 Pro. DATRON’s tool cooling is also compatible with machines from other manufacturers. 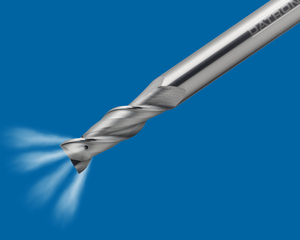 Through an internal coolant supply the end mill is cooled while chips are safely and efficiently removed due to its special geometry - even at speeds up to 40,000 rpm. The internal cooling also positively affects the service life, the changeover times, and thus it lowers the acquisition and operating costs of the tools. Also, the DATRON specially-balanced single flute end mills in ultra-fine grain quality reduce costs. Their great chip flute leads away chips efficiently and can go with high feed rates into the material. On its first booth specifically for HSC tools DATRON presents six different product groups and accessories, for instance DATRON tool holders. At the main booth A52 in hall 16, DATRON experts demonstrate the production of industrial components on the CNC machines M8Cube MLCube LS "around the clock". The worldwide successful high-performance milling machine M8Cube stands for a dynamic cutting cycle resulting in mirror-smooth surfaces and finest engraving and drilling details. At METAV, it live produces complex electronics housings using a 3 kW high-frequency spindle. In the manufacturing industry, the M8Cube masters precision drilling of 3D aluminum molds, graphite electrodes or test adapters with up to 60,000 rpm. At the same time the machine was designed for acceleration and stiffness to ensure an excellent surface quality. The DATRON MLCube LS, with a particularly large production area in relation to its relatively small footprint, provides special advantages for batch production applications. At METAV 2016, the MLCube LS demonstrates its great large-format through live producing workpieces from the aerospace sector. Also front panels and housings can be manufactured with the machine ’ s economic and power saving features: The brand new linear scales measuring system compensates temperature fluctuations optimally and adds greater precision to the X- and Y-axes. At METAV equipped with a 4-kW high-frequency spindle the MLCube LS reaches up to 40,000 rotations - using a different set-up, the MLCube LS even works at 60,000 rpm. The machine’s core application sectors are the automotive industry and its subcontractors plus the aerospace industry.